Who doesn't like music? Not many. But musical tastes vary widely, and the musicians of my extended family are no exception. My family has so many musicians that I thought they deserved a series of their own. Ergo "My Musical Cousins." 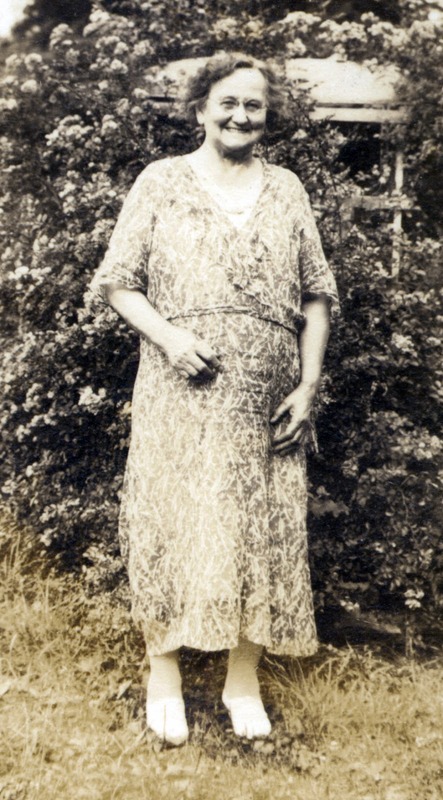 Mary Elizabeth Grant McNaughton (1856-1946) in 1934. First up is my second cousin once removed Roger Jon McNaughton (born 1952). 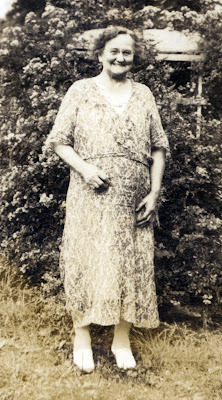 Roger's and my common ancestors are my great-great-grandparents William Malcolm McNaughton (1850-1914) and Mary Elizabeth Grant McNaughton (1856-1946). William and Mary were Roger's great-grandparents. 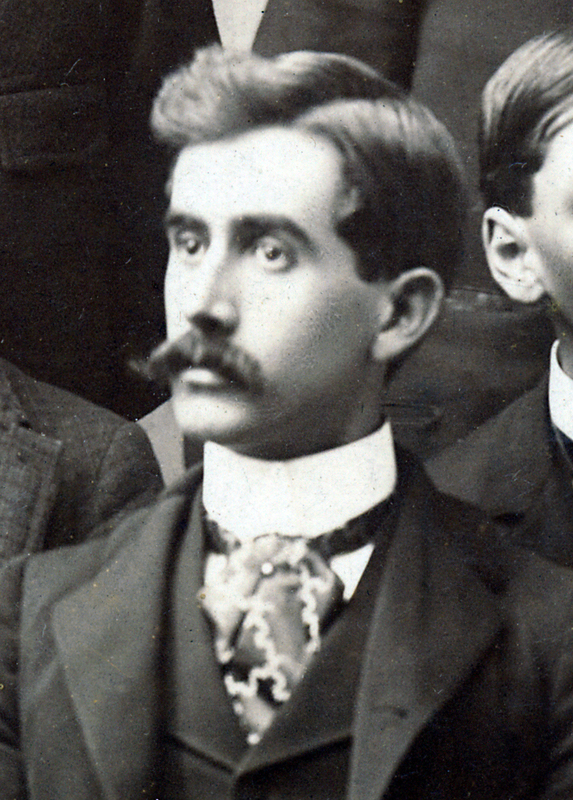 I've never met Roger--the closest I've come is meeting his brother Al, who's also into family genealogy. Roger's stage and recording name is Doc Bellows. He plays accordion in the band Pioneer Pepper and the Sunset Pioneers, whose specialty is preserving the songs of the singing cowboys of motion picture and radio fame--Roy Rogers, Gene Autry, and the Sons of the Pioneers. Pioneer Pepper and the Sunset Pioneers perform tunes such as "Happy Trails," "Back in the Saddle," and "Streets of Laredo." Here's their website. Two compact discs of their recordings are available. I've had both for several years now. Cowboy tunes aren't my top type of music to listen to, but I pull these out every once in a while for a change of pace. The songs are varied and tuneful, the voices and musicianship are graceful and smooth, and the production is excellent. I prefer the songs that were already old when the singing cowboys were current, songs such as "Home on the Range" and "Red River Valley," but the Sunset Pioneers' performances of more recent compositions such as "Tumbling Tumbleweeds" and "Vaya Con Dios" are just as enjoyable. I wouldn't mind if the closing tracks on each cd, contemporary pieces written in singing cowboy style by lead singer Pioneer Pepper, had been left off--the performances are good, but the material just doesn't measure up to the authentic stuff that fills the rest of these cds. If you're into this sort of music, don't miss these recordings. If you're curious, these are a safe bet for sampling. Both cds are available to order in the store on the Sunset Pioneers website. 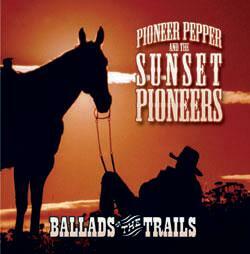 Pioneer Pepper and the Sunset Pioneers compact disc. The accordion playing of Doc Bellows--aka Roger McNaughton--is easily distinguished on the Sunset Pioneer recordings and his talent and versatility are obvious. As his online biography makes clear, he can play a wide variety of instruments and is also a talented vocalist and a former voice teacher in his native Ohio. Pioneer Pepper and the Sunset Pioneers are based in the Mesa, Arizona, area. They've performed internationally, but they mainly play in the south-central area of Arizona around Phoenix. Their schedule--click here--shows them performing pretty often, so if you're in the area, check them out and say hi to my cousin Doc Bellows.